Provides a complete analysis on how to recognize authentic autographs and expose forgeries. 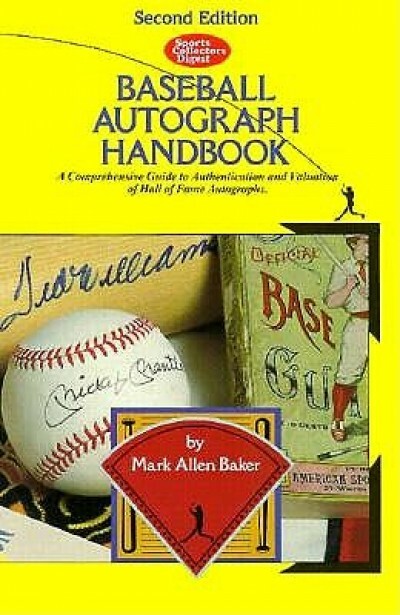 Learn how to authenticate and price the autographs that interest you with insights from Mark Allen Baker. Variations also shown for signatures. Contents: Baseball, Cooperstown and the Hall of Fame; The philosophy of collecting; The history of writing materials; The autograph collector's language; Acquiring baseball autographs; Autograph variations; Forgery detection; Collection organisation and display; Autograph preservation; Hobby ethics; Baseball autograph values; Collecting Hall of Fame plaque postcards; Collecting Perez-Steele postcards; Collecting autographed baseballs; Collecting autographed bats; Hall of Fame autographed gallery; Gallery of Superstars; Market update and current trends; Footnotes; National Baseball Hall of Fame Members; Frequently requested addresses.